Ardis Kiel Bazyn was born in Alvord, Iowa. When she lost her sight in a car accident at the age of 20 she had to decide whether the accident was going to define her or whether she could overcome it and move on. Not someone to give up easily Ardis completed rehabilitation, then food service management training and was given the opportunity to manage food service facilities in South Dakota and Iowa. As wife of a husband with multiple disabilities and mother of two pre-teen daughters, she accepted the additional challenge of going back to college while working full-time in her food service business. In 1996, she received two BA degrees: Public Relations and Speech Communications. In 1998, she completed her Master's Degree in Arts in Teaching from Coe College in Cedar Rapids, IA. 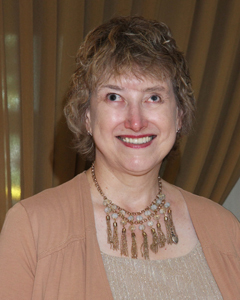 Ardis has also been active in local churches and a variety of nonprofit organizations including Christian Women's groups, leading seminars on various topics and working on writing projects for those organizations. Ardis uses what she teaches others in her own life and, although she can’t see, countsreading, singing, dancing, cross country skiing and snowshoeing among her hobbies! How can someone who can’t see cross country ski? Well it’s all part of making the impossible possible! 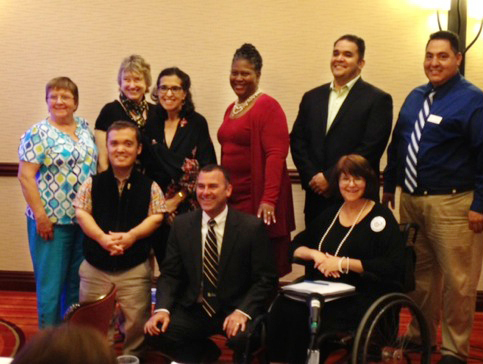 In April, 2013, Riverside Mayor Rusty Bailey attended the California State Independent Living Council meeting to honor and help swear in new and reappointed Council members. As the owner of Bazyn Communications, she's written several books, many articles, and manuals. Some are included on the FREE RESOURCES link, have a look!